Now we're taking a short poetry break between nonfiction units. What fun! Here are some things that are working really well in my classroom. Poetry Display: Over the past few years, I've scoured the used bookstores to gather enough poetry books so that every student can have a book. Now I have a poetry display with a wide variety for students to browse during independent reading, before school, and during free time. They really like them! This year, my students love The Random House Book of Poetry for Children...one of my personal favorites as well. I think I'll have to attach a GPS tracker to this book to keep track of it! Another favorite is Mary Had a Little Jam, a book of silly rhymes. 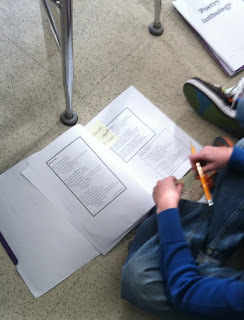 Exploring Poetry: I also like to use class time to get students used to browsing through poetry book. 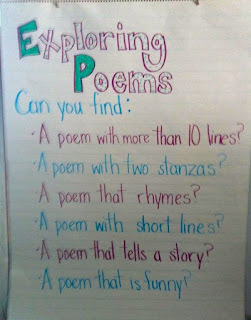 I used the Exploring Poetry poster below to get our explorations started. While some students will just sit down and look at poetry, others need more of a scavenger hunt approach. They eagerly started working with the sticky notes to mark different poems. The sticky notes are left in the books throughout the unit, so that other students can see the breadcrumbs left behind. I started the unit by talking about poetic structure, and we worked to find the number of lines and stanzas in poetry. Taking just a few minutes to do this makes talking about poems much easier. I've also started out with having students do a few copying tasks. Readers have to see that everything in a poem is a choice made by the author, and rewriting a short poem is a great way to examine line breaks, capitalization, and punctuation. This year, I want students to experience reading and rereading poems for different purposes. I put together an assortment of poems into a booklet that I copied for students. This booklet is useful because students can write directly on the poems and mark favorite passages. Instead of just seeing poems on single pages, students are going back to the same poems again and again--"Oh, I think there's personification in the stinkbug poem!" or "This is my favorite!" All of the poems are written by me or in the public domain...I'll be adding it to one of my poetry packs shortly. Write to me if you'd like to try it. Now we're moving forward into examining figurative language. It's so much fun to see how students respond! As I've been working with my students on creating main ideas and building paragraphs, one nagging problem has come up again and again: the use of transition words in writing. In some ways, using transition words is like summarizing. It's easy to tell kids how to do it. Curriculum guides seem to assume that just teaching the rules will lead to proficiency. But those of us in the classroom know just how deep the chasm between knowing and doing can be. Is using transition words as important a skill as summarizing? Maybe not. But I'm beginning to believe that transitions deserve much more time in the curriculum. As I look at writing units ahead, I'm planning to take a more detailed, nuanced approach to teaching transition words. Here are some steps that I'm taking. On the first day back from break, I taught what I thought was a solid lesson about using transition words. We read a paragraph, found the main ideas, and highlighted the transition words. "Transition words connect ideas," I told students. Then, just before recess, I did some quick-check closure. I pulled popsicle sticks and asked some closure questions--"Why are transition words important? What are some examples of the transition words that we found in the paragraphs?" The sound of the crickets chirping was deafening. Like some kind of blobbish jello, the word "transition" had slid right past my students' ears and brains. They couldn't tell me what transitions were, nor how the words are important. Was the lesson so horrible? An experience that I had that very night shed some light on the issue. In my spare time, I've been trying to learn German--mostly because there are lots of available online resources from Deutsche Welle, and because I want to feel what it's like to learn to read academic language in another language. As I tried to read a very simple paragraph, I noticed that I was sliding right over the transition words. In my attempt to build meaning, I focused mostly on the verbs and nouns. I couldn't fix this in one day of instruction. But I could make sure that they caught hold of the word "transition" and recognized it as something important--even if they didn't have a firm grasp of what it meant. The next day, I started the lesson by saying that everyone would need to be able to tell me what a transition is by the end of the class. The promise of some additional preferred activity time upped the stakes! This time, my goal was more achievable--I just wanted them to know that transitions exist. We met this goal. The next step was to teach transition words--by their absence. I gave students paragraphs that I developed from the blue whale details we had looked at before. I left blanks for the transitions, and gave students a word bank of transitions. It's nothing really new or earth-shattering, but it helped me to see how students were thinking. Many of them were happy to use "in fact" twice in the first paragraph--which led us to a discussion of variety. The use of transitions like "even though" is extremely difficult for fourth grade writers. Think about how much meaning is conveyed in these two little words. Now think about how hard it would be to write without access to this construction. Transitions like "even though", "however", and "despite" are essential to conveying and understanding complex ideas. This is why I've come to believe that transitions are so vital for learning. Not only are they important for good writing, but they are also important for understanding complex ideas. Once students became more aware of transitions, I started noticing them everywhere. And they aren't always being used appropriately. But I think this is an essential phase of student development. They know that something needs to connect two ideas, but they aren't sure of which word to use. I'm much happier at this stage than the previous stage. With my early adopters (you know, the kids who really take in lessons and move quickly to the action phase! ), I'm seeing the phrase "As you can see..." pop up again and again in reading responses, and "despite" showing up in science class. Right now our work with transitions is mostly focused on the typical statement and support paragraphs. As we move into other text structures, it will be interesting to see if students can generalize what they have learned, or if we'll need to go through every step in the process again. One thing is certain--transitions are far from simple for intermediate learners! We're getting ready to finish our introduction to nonfiction unit. I'm looking forward to a short poetry unit before plowing forward into text structure. Here are some things that I've added to my nonfiction teaching over the past two months. For my reading classes, each student has a folder that stays in the classroom. This helps to keep everyone organized from day-to-day. However, these folders can get very full by the end of a unit! This year, I've started doing an end of unit reflection page before we clean out our folders. As students fill in the blanks on the reflection page, they reflect both on the content of the unit and on the reading skills that we've worked on. It's a nice but low-key way to add some closure to the unit and send home all of the classwork that we have accomplished. This year I jumped into looking at the differences between firsthand and secondhand accounts. How interesting! Luckily, when learning about Antarctica, great firsthand accounts are easy to find. We started by looking at the LTER blog. This year's author has an easy, kid-friendly style. Kids were excited to see such recent blog posts! As we read the projected blog on the screen, I experimented a bit to see how kids were processing the text. -How do we know that this is a firsthand account? -Can we figure out the author's attitude toward the events? Which words convey her feelings? -How do the pictures add to the information? We also played around a bit with how to navigate a blog and what all the different links mean. Overall, this part of the class was successful and I felt as if starting with a blog was a good idea. Then they moved on to reading a firsthand account, "The Chilling Fields", a story about a fire aboard the Aurora Australis. This text is a little harder for them, and they are having some trouble piecing together what happened. I'm listening in on their conversations to help me figure out how to adapt the process of reading and thinking about a firsthand account to younger readers. Tomorrow they'll be looking closely at word choice to figure out the author's attitude toward the events. It will be interesting to see what they come up with. I am working on a sheet to guide readers through the process...write to me if you'd like a copy! It's still very much in its early stages. I'm still experimenting with this. You may be familiar with the weekly homework packets that I've been making. This year, I'm adding a vocabulary quiz to try to boost student accountability. I like the quizzes in that they are increasing word consciousness and helping students to pay more attention to vocabulary activities that we do together. You can find the winter homework packets here. Topics include polar bears and penguins, the LTER cruise, birds at a birdfeeder, and the flu! I can't wait to start poetry. In the past, I've gone right from this introductory nonfiction unit to text structure. I think that poetry will be a fantastic break for us and a nice way to look at very different texts. This is a fun strategy for teaching students to attack multiple choice questions. I created it last year when I saw that many of my students were impulsively circling any old answer that kind of went along with the text. For these students, the task of reading the multiple choice question is a huge cognitive load. How could I help them? I decided to create a simple mnemonic tied to concrete objects. Just like the "click and clunk" strategy, I wanted something that would teach itself. Once students know the objects, they can draw them at the top of every test. Then they can use the objects to help them as they answer the questions. These strategies work for most questions. Best of all, they give kids a place to start when confronted with a page of multiple choice questions! Because I wanted to give students some practice, I made up some daily warm-up activities. There is one text per week, with a question for each day. So far, it's just the right amount of test prep--about 5 minutes each day, with a short discussion, and then it's on to better things! Today was our first day back to school after the holiday break. I jumped right into the instruction, taking advantage of the mini-honeymoon period after the break to do some tough teaching. Today we looked at main idea from two different perspectives--creating details to support a main idea, and writing a main idea to fit the details. In writing class, students started writing paragraphs about their holiday break. They chose whether their holiday break was relaxing, eventful, or exciting. Then, they used a graphic organizer to collect details to support that main idea. In this case, students were working from main idea to small details. (The entire lesson is free over at TeachersPayTeachers.) It went surprisingly easily. Students eagerly got to work, and were able to choose the details from their holiday break to support the main idea that they had chosen. In reading class, students went in the opposite direction. We've been researching various topics related to Antarctica. Today, students put together their notes and created main ideas based on the information they had collected. In typical fourth grade fashion, many students jumped into writing, "Where the red salamander lives." "No," I said. "Remember, a main idea needs to be in a sentence! What is the sentence that you could write?" "Um--this is about where the red salamander lives?" It took a little bit of pulling teeth, but one student finally suggested, "Red salamanders live in different places." Great! This is definitely supported by the details. Another one said, "Red salamanders live under a variety of things." I liked this main idea sentence because every one of the details does relate to that idea of under, and the sentence showed that pretty nicely. In the next example, students showed a little more independence. We read the details aloud and talked about how they all related to the appearance of the red salamander. "What the red salamander looks like," one student wrote. I sighed, thought of the lost holiday break, and jumped in again. "Remember," I said, "A main idea needs to be stated in a sentence." "The red salamander is colorful," another student wrote. This main idea is very much supported by the details--notice that all of the details have color words! Some students noticed that the red salamander is not always red. They struggled with how to put this idea into words. After looking at various examples of a main idea, I modeled the use of the word despite. Despite its name, the red salamander can be may different colors. I'll be curious to see if the word despite makes its way into any of their finished reports! Next, of course, the students will be using the same graphic organizer that they used for the holiday writing prompt to organize their research notes. Notice how this is the opposite of the first activity. Instead of choosing details to support a main idea, students will be crafting a main idea to fit the details. Writing with main ideas in two different ways in one day--that day being the first one back from break--was actually easier than I thought. Both lessons strengthened one another. The message of supporting main ideas with details was clearly conveyed in two different ways. And now it's just two more days until the weekend!